The Charter Township of Flint is a charter township of Genesee County in the U.S. state of Michigan. The population was 33,691 at the 2000 census. The City of Flint is adjacent to the township on the east, but is administratively autonomous. According to the United States Census Bureau, the township has a total area of 23.6 square miles (61.2 km²), all land. The Township is mostly an L-shape around the Southwest side of the City of Flint and split in two along I-69/I-75 interchange South along Bishop Airport to Mundy Township. As of the census of 2000, there were 33,691 people, 13,972 households, and 9,025 families residing in the township. The population density was 1,425.5 per square mile (550.5/km²). There were 14,864 housing units at an average density of 628.9 per square mile (242.9/km²). The racial makeup of the township was 77.77% White, 16.12% African American, 0.61% Native American, 2.20% Asian, 0.02% Pacific Islander, 0.75% from other races, and 2.55% from two or more races. Hispanic or Latino of any race were 2.33% of the population. There were 13,972 households out of which 30.4% had children under the age of 18 living with them, 45.5% were married couples living together, 14.9% had a female householder with no husband present, and 35.4% were non-families. 30.5% of all households were made up of individuals and 12.6% had someone living alone who was 65 years of age or older. The average household size was 2.36 and the average family size was 2.94. In the township the population was spread out with 24.4% under the age of 18, 8.6% from 18 to 24, 28.0% from 25 to 44, 22.9% from 45 to 64, and 16.1% who were 65 years of age or older. The median age was 38 years. For every 100 females there were 87.5 males. For every 100 females age 18 and over, there were 82.2 males. The median income for a household in the township was $39,718, and the median income for a family was $48,763. Males had a median income of $41,449 versus $26,933 for females. The per capita income for the township was $22,216. About 7.8% of families and 10.4% of the population were below the poverty line, including 15.4% of those under age 18 and 6.5% of those age 65 or over. Bishop International Airport is adjacent to Flint Township. The township is served by the Mass Transportation Authority bus lines. In addition, three major highways-I-75, I-69 and US-23, which run through the township-intersect one mile (1.6 km) from Bishop Airport. Also, three major rail lines-Grand Trunk Western, CSX Transportation, and Central Michigan Railway-intersect at the township's northern border. Wayne County was formed with in the Northwest Territory covering the Lower Peninsula. The Saginaw Valley Treaty was signed with the Chippewa Indians in 1819. 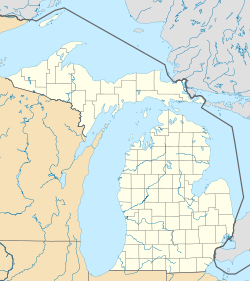 In 1836, the Pewanigo tribe of the Saginaw Indians sign a treaty with the US government that gave all remaining land in Genesee County for 13 sections of land west of the Mississippi River with the land to be sold for the Indians' benefits. For additional information, see Genesee County, Michigan and Michigan. Flint Township was organized in 1836 and included the township areas of Burton, Clayton, Flushing, Mt. Morris, Genesee, Thetford, Vienna and Montrose. On March 11, 1837, Vienna Township was organized to include the future townships of Montrose and Thetford. Genesee and Flushing Townships where split off on March 6, 1838. On April 19, 1839, Kearsley Township was split off from Flint Township until March 7, 1843 when it was merged back into Flint Township. Clayton separated from Flint on March 25, 1846. In 1855, Mt. Morris Township on February 12 and Burton Township on October 12 separated from the Township. The now City of Flint was incorporated as in 1855 thus spliting its area from the Township. The Township was then temporarily known as Garland Township after Burton was split off on October 12, 1855 to February 5, 1856. The first permanent settlers in the area were Elijah Carman and his family, who arrived in 1835. In the next year, on March 2, 1836, Flint Township was organized. Many other settlers followed, including the Torrey, Dye, Utley, Bristol, and Carter families. Many of Flint Township's primary roads are named for these families. In 1878 the first schoolhouse was built in Flint Township. Eventually as many as ten school districts were created within the township which later merged in a few and the Township is primary served by Carman-Ainsworth. After the City of Flint annexed the GM Van Slyke plant, the Township place on the ballot an incorporation question that would have made it the City of Grandview Heights. Another item on the ballot was the election of a mayor for the new city. The incorporation question failed, while the Township Supervisor won the mayoral election. Today Flint Township is the retail center of Genesee County, home to the Genesee Valley Center shopping mall. An average of 100,000 people visit Flint Township each day. Flint Township is also home to a campus of Baker College. In addition it is home to the General Motors Truck and Bus Center warehousing facilities. ^ Hayes, Yutha (1976). Going up the Swartz. Swartz Creek: Bicentennial Commission of Swartz Creek. ^ a b Wood, Edwin O. (1916). History of Genesee County, Michigan, Her People, Industries and Institutions. Michigan Historical Commission. http://www.usgennet.org/usa/mi/county/lapeer/gen/ch5/pio.html. ^ a b Ellis, Franklin (1879). History of Genesee county, Michigan. With illustrations and biographical sketches of its prominent men and pioneers.. Philadelphia, PA.: Everts & Abbott. p. 345. http://www.hti.umich.edu/cgi/t/text/pageviewer-idx?c=micounty;cc=micounty;sid=bc2e9508b2f4f83b0bb57f56ffd896b4;q1=Burton;q2=Genesee;op2=and;op3=and;rgn=pages;idno=bad0919.0001.001;view=image;seq=507;page=root;size=s;frm=frameset;. ^ Historical Collections. Michigan State Historical Society, Michigan Historical Commission. 1907. p. 362. http://books.google.com/books?id=RhUUAAAAYAAJ&pg=PA362&lpg=PA362&dq=Garland+Flint+Township&source=bl&ots=F3QrKjex_B&sig=jZoMGyLwXqqA0imjP3apCGV0Zt8&hl=en&ei=6DmxSd-xKJLIMqXvmd4E&sa=X&oi=book_result&resnum=5&ct=result#PPA362,M1. ^ Genesee Valley becomes new 'downtown' for Flint area. Flint Journal. Booth Newspapers. This page uses content from the English language Wikipedia. The original content was at Flint Township, Michigan. The list of authors can be seen in the page history. As with this Familypedia wiki, the content of Wikipedia is available under the Creative Commons License.